Gain greater insight and make better decisions, all while reducing risks and costs in less time than ever before. Drones make it all possible. Say goodbye to the high costs of hiring manned aircraft or relying on stationary single-view construction cameras to monitor jobsite progress. Drones have made it easier than ever before to obtain aerial images and videos whenever and wherever you need them, giving you the essential data you need for safer and more efficient builds. Monitor, document, and track your progress with revolutionary efficiency and accuracy that helps you avoid accidents, delays, and cost overruns. Drones, sensors and flight operations are redefining the limits of aerial intelligence. Gain more from your data with a suite of automated analytics. Smarter construction starts with detailed, dynamic data to create robust models and spur insightful action. With ARC Drone Services, you gain access to a nationwide fleet of FAA-compliant, licensed drone operators ready to deploy and deliver the data you need to make crucial decisions in as little as 24 hours. Equipped with innovative, leading-edge sensors and the latest scanning and imaging technology, ARC’s drone fleet gathers up-to-the-second data to generate a suite of automated analytics with a broad range of applications to conserve time and maximize profits. Land and Site Surveys: Drones safely survey and map any property or terrain and return results faster and with more precision than traditional methods. Jobsite Progress Tracking: Monitor changes and document progress no matter where you are with a concrete visual timeline for improved accuracy of your scope, schedule, and budget while also reducing your risk for future claims. Site Conditions: Gain insight into site conditions with every-angle accuracy above and below your site’s surface that traditional inspection and survey methods may miss. Jobsite Inspections: Drone technology can help find and resolve concerns before an inspection takes place while also providing inspectors with accurate images that make the process run smoother and more efficiently. Safety Surveys & Security Monitoring: Deploy drones to monitor your jobsites and protect against loss of materials with aerial equipment maps, and keep your workers safe with aerial inspections that can identify structural, biological, and other safety hazards in real-time. 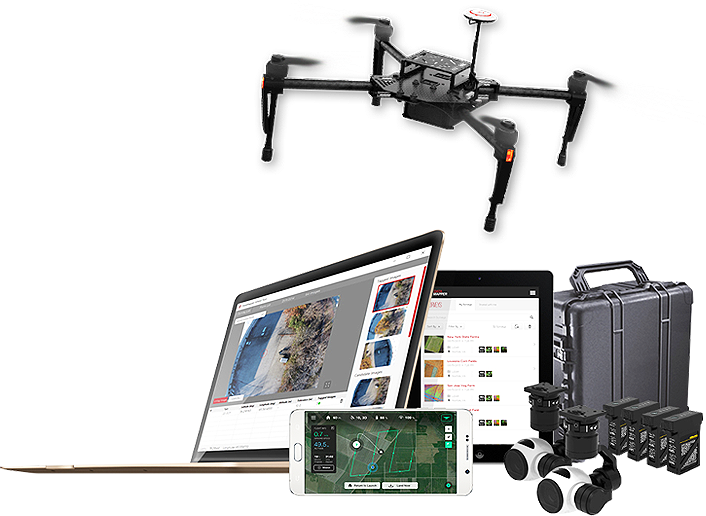 Photo and Video Capture: Identify and label locations, resources, and assets with high resolution images that offer an unprecedented overview of your site at any stage, and capture progress with aerial videos from any angle or height quickly and safely. LiDAR and Thermal Scanning: Map large sites, generate digital surface models, build topology models and contour line maps, calculate volume measurements, and more with one single stream of accurate data collected using drone-mounted LiDAR (Light Detection and Ranging) sensors that capture data up to 70% faster than traditional methods. Gain aerial heat images and thermal footage to inspect, map, and gain valuable insight into any location. Hyperspectral Imaging: Using electromagnetic radiation at wavelengths that are not limited by the visible spectrum, hyperspectral images can provide information about soil conditions before you break ground, locate asbestos in components of existing structures, and new research has found that it has the future application potential serve as a non-destructive tool to test the strength of construction materials. 2D and 3D Mapping: Measure and map any area and terrain no matter where you happen to be at any stage of the process, gaining vital details to use in marketing materials, inform your bids, generate models, and make strategic decisions based on up to the minute conditions. BIM Conversion: Drone-generated point clouds contain millions of points of resolution and can be used to generate highly detailed 3D models at a fraction of the cost and in less than half the time it could take to complete a less detailed ground-based survey method to generate a BIM model. 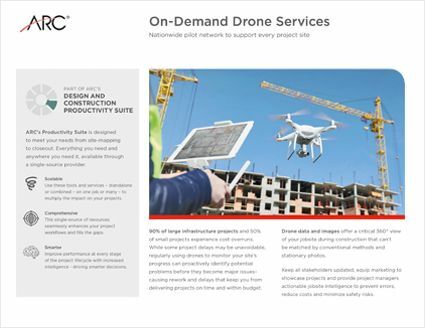 Utilize ARC’s on-demand drone services with access to a nationwide pilot network to support every project site. Traditional estimating and bidding approaches eat up time and resources while still producing results that are imprecise and lead to unreliable budgets. 90% of large infrastructure projects and 50% of small projects experience cost overruns. While some project delays may be unavoidable, regularly using drones to monitor your site’s progress can help you identify potential problems before they become major complications that keep you from reaching project milestones on time and within your budget. Drone data and images may offer protection against future costs, as well. If the need for mitigation arises after your project is complete, drone-collected data and imagery can offer a critical 360° view of your jobsite during construction that can’t be matched by conventional methods and stationary photos. Drones allow for safer mapping and greater cost efficiency than traditional survey methods, and with greater insight into progress and conditions, projects are more efficient from bid to closeout. Outsourcing drone services further reduces costs by eliminating the need to frequently invest in new technology or take on the liabilities of drone operation, allowing you to focus your time and your team’s talents on the work you do best. More than 15,000 qualified and licensed drone pilots in the United States. With ARC Drone Services, gain access to trained and qualified drone operators with the latest technology across the country. Our extensive fleet of pilots have access to a range of fixed-wing and multi-rotor drones with the flexibility for various sensor payloads, providing you with the data you need to improve the performance of your projects, prevent rework, and avoid delays with real-time progress and safety inspections performed exactly when you need them. Pilot procurement and data delivery are optimized to deliver imagery in as short as 24 hours. You can’t predict everything no matter how proactive your plans. When questions arise, and you need data now, our quick deployment and delivery system will get your drone in the air and data in your hands as fast as possible, sometimes in only 24 hours, so small snags don’t turn into drawn-out delays. Licensed operators fly missions under the applicable regulatory protocol required by the FAA. Your job is hard enough without having to worry about safety risks and FAA regulations. With ARC Drone Services, you can reduce the risk of operations as well as the need for added staff or overhead costs while still gaining access to crucial drone-gathered data. With our commitment to safe and compliant operations, you can focus on what you do best knowing that we’ll only send licensed and experienced operators out to gather your data. The drone images turned out fantastic. I was very pleased with ARC’s timeliness of scheduling and executing the photo shoot on such short notice.